Raging Bull Casino is a Real Time Gaming destination that offers hundreds of online casino titles. They provide games for instant play, download and mobile platforms. The wide-ranging catalogue includes online slots, video slots, table games, online roulette, online blackjack, video poker and progressive jackpot games. 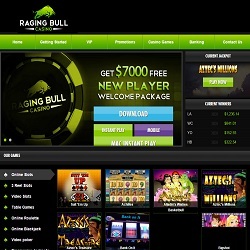 Raging Bull Casino has a simple design utilizing various shades of green on black and grey backgrounds. Players are greeted with the newest rewarding offers and the unique game selection. The simple registration requires only vital data and it provides a Real Money Account with the possibility to play for fun. What’s more, this destination is available for US players too. Players can choose from different platforms at Raging Bull Casino. This destination is accessible after a download, instant play in-browser, and mobile. Payments are manageable with Paste Pay, Wire Transfer, Eco, Neteller, Skrill, Visa or MasterCard. Unfortunately, Raging Bull Casino accepts only US dollars and processing your withdrawals takes them an alarmingly long time. On the other hand, the promotions are incredible at Raging Bull Casino. Players can pick from countless of coupon codes and special bonuses. The Welcome Package brings $850 and 50 free spins. The free spins bonus and the $50 initial bonus are not tied to deposits. Also, they have promotions for each day of the week such as the 15% Monday Cashback with a 100% up to $100 on any game. Raging Bull Casino is a RTG, Realtime Gaming, site. RTG is one of the most renowned software providers, so the quality of the games is guaranteed. RTG’s portfolio is huge, but some players might enjoy a more varied selection. Raging Bull Casino offers four high-quality blackjack titles, designed by RTG. Classic Blackjack and European Blackjack cover the essentials. Perfect Pairs, Match Play 21, Face Up 21, Super 21, and Let Em ride offer a little more variance. At the Raging Bull Casino members can enjoy online slots, table games, online roulette, online blackjack, video poker and progressive jackpot games. In the Video Slots menu casino enthusiasts will find superb titles like the Crazy Vegas slot, Enchanted Garden slot, Fame and Fortune Slot and the Coyote Cash slot. Raging Bull Casino offers American Roulette, Multi Player Roulette, Pai Gow, Baccarat, Pontoon, European Roulette and many other titles in their table games category. Video Poker is represented by 10 variants, such a Loose Deuces, Pick’em Poker, Jacks or Better or Deuces Wild. The Curacao licensed Raging Bull Casino runs with Real Time Gaming’s software that offers hundreds of topnotch online games. 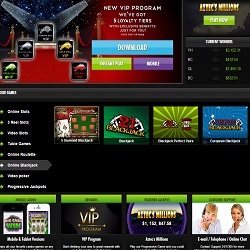 This unique online destination is perfect for those who like daily promotions, no deposit bonuses and mobile gaming. 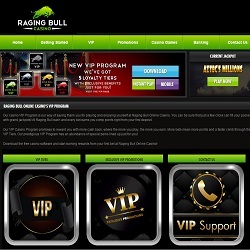 Raging Bull Casino provides secure and entertaining gaming to all casino enthusiast. However, if fast payment processing is a must for you, choose another online casino. Raging Bull Casino does not provide live games of any kind but players can enjoy their online titles on all devices. Raging Bull Casino is available on all platforms. All you have to do is open the site in your phone’s or tablet’s browser. The game selection on mobile is bit more restricted, however there’s still enough entertainment for the go.